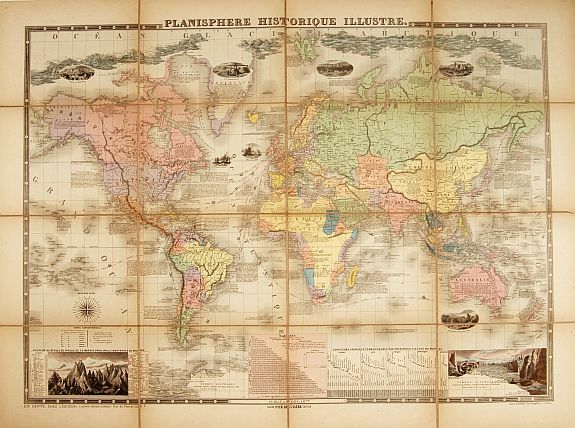 32 DESNOS, L. C. Mappe-Monde ou Carte G�n�rale de la Terre� Paris, 1772. Limites en col. ancien. Exemplaire restaur�. - Carefully restored. 785 x 1009 mm. 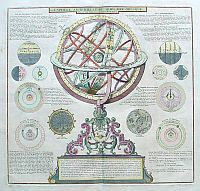 � Version post�rieure de la carte murale de Nicolas de Fer de 1694 (Shirley, 560). 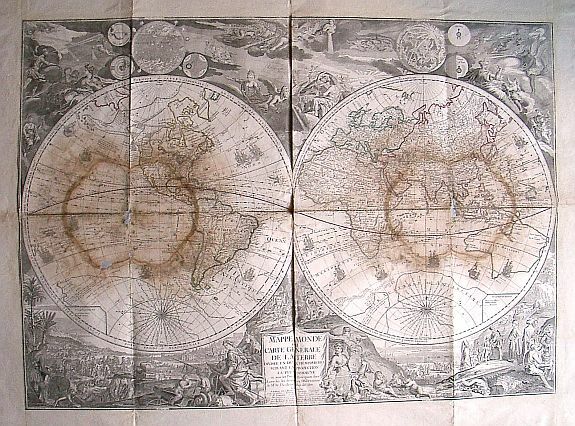 Deux autres versions publi�es par Danet, datant de 1730 et 1737, sont �galement connues. Cette �dition est inconnue de Mr.Shirley. - Wall map hangs beside the finest paintings in the offices of prosperous merchants, in the halls of government and the homes of the wealthy. See, for example the paintings of Vermeer, where wall maps appear in a variety of settings. This work's ornamentation exceeds the pictorial richness usually achieved on a map. Two fully realised panoramic harbour scenes, intended to represent the major human enterprises and activities, are on the bottom of the map. A similarly detailed presentation of the heavens appears at the top of the map. A later version of Nicolas de Fer's wall map of 1694 (Shirley 560). Versions issued by Danet, dated 1730 and 1737, are known. This edition, dated 1772, by Desnos is unknown to Mr.Shirley. With extensive amendments; Tchirikow's voyages of 1741 are shown, an enormous lake in the north-west United States and Canada, called the Sea of the West, as well as other fictional bodies of water further to the north. 35 HERMET, F. Planisph�re historique illustr�. Paris, 1877. Lithographie en couleurs. Entoil� et pli�. 750 x 1040 mm. 36 ANONYME. Grand Planisph�re Politique, Economique et Commercial au 1 : 10 000 000. Paris, Maison Forest -E. Girard, ca. 1930. En couleurs. Planisph�re monumental entoil�. 1980 x 4000 mm. 37 DE FER, N. La Sph�re artificielle ou armillaire oblique, �lev�e sur l'horizon � la latitude de Paris. Paris, 1740. Beau col. Repair of a split lower part center fold. Fine col. 400 x 418 mm. � Grav� par Starckman. 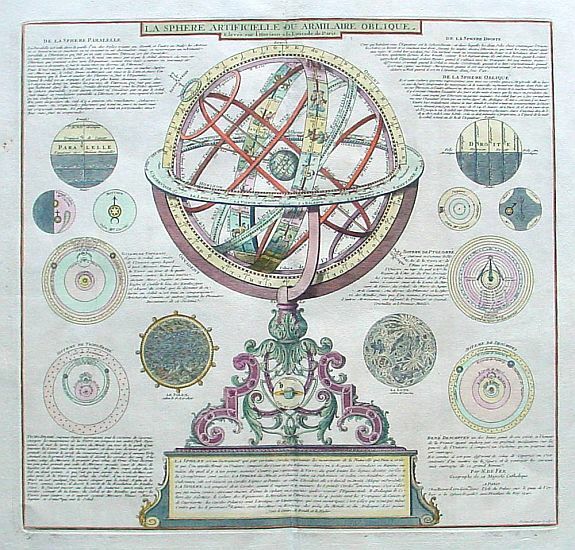 - A decorative print of a armillary sphere, surrounded by the sun, moon, Venus and Jupiter and circular diagrams illustrating the theories of Ptolemy, Copernicus, Brahe and Descartes.